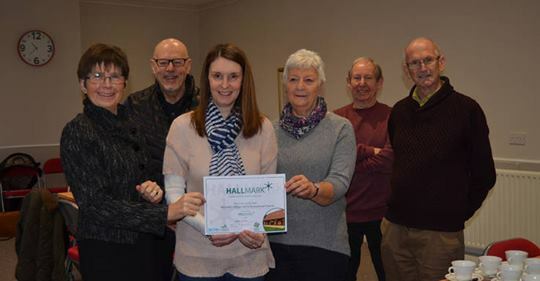 Congratulations to Gainford Village Hall who have recently been successful in achieving the Hallmark 1 quality standard award. The volunteer members of the management committee received their Hallmark 1 certificate in a presentation ceremony attended by Helen Brown from Durham Community Action who operate the scheme across County Durham on behalf of Action with Communities in Rural England (ACRE) who organise the schme nationally. “We are very keen to engage with the Hallmark award scheme. It allows us to check that we are running the village hall to the highest of standards, in line with national good practice, so it is really good news we have achieved level one. Hallmark is a national quality scheme for community buildings, which was launched in 2007 by ACRE. There are three levels of the quality standards for different aspects of village hall management. “Tracy Emery, from Durham Community Action, has been really supportive in signposting us through this process. We felt rather under scrutiny, which of course we were. She was very thorough in her examination of our processes, policies and documents, so it was a great relief to know she thought we were doing a good job,” he added.